Microcomputers are just beginning to enter American homes and schools. They are an everyday fact of life for a few children and they will soon become commonplace for many more. So it is hardly too soon to wonder what effects computers are likely to have on our children. Will computers change the way children learn? Will computers change the sorts of people our children become? I believe the answers may well be yes, and although it is too early for conclusive proof, I can offer here a story that supports my belief. I have worked in the computer industry for over fifteen years, and when my children were born I became interested in the potential impact of early computer experience on children’s learning Several years ago, in collaboration with the LOGO project at MIT, I began an intensive study of how daily access to a computer influenced the way my two older children—then aged six and eight—learned the basics of arithmetic. By the time their younger sister Peggy turned three, a microcomputer had become standard equipment in our household, and I began to develop several programs to give Peggy access to the machine. Playing with these programs in her own way and on her own initiative, Peggy has begun to do something that looks very much like the beginnings of reading and writing. All this has happened in the last seven months, but the way it has happened is at least as interesting as the claim itself or the extent of its truth. What is it like to put a microcomputer in your living room and let your three year old play with it ? The answer depends on who you are, on your knowledge and values. The computer entered my living room and my family life because it is part of my culture and not—in case anyone wonders—because I am prepping my toddler to enter medical school. 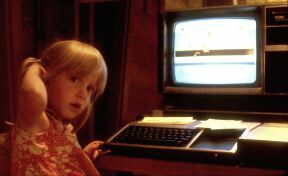 My interests in children and computers led me to gather a great deal of detailed information about what Peggy knew before her first encounter with the computer and how her knowledge changed over the time she has been interacting with it. The following sketch is based on my observation of only one child’s learning, but I believe it will be of general interest because microcomputers are penetrating our society now and Peggy’s story provides some advance information about how that fact may affect our children. Children typically learn to read at school around the age of six A few teach themselves to read earlier. Rarely, one hears of children as young as three reading the New York Times to their parents and so forth. Peggy, at the age of three, even living in a bookish family, did not know how to read in any substantial sense before her computer experience. Her knowledge of letters at three years and three months of age was quite specific and limited. She recognized only a few letters as distinct symbols with any meaning. For example, she knew that “P” was the first letter of her name. She also recognized “G” as the “mommy letter” because her mother’s name is Gretchen. What was Peggy’s understanding of spelling? One incident gave me some inkling. My oldest daughter was learning a bit of French; one day Peggy claimed that she knew how to “spell French” and continued, “un, deux, trois, quatre, cinq.” At another time her spelling of “French” was “woof boogle jig.” (Some of you may recognize this as the Klopstockian love song from a W.C. Fields movie.) Peggy seemed to have the general idea of spelling as decomposing a meaningful whole into a string of essentially meaningless symbols, but she had not yet learned any of the culture-standard assignments of letters to words. Peggy’s ability and willingness to identify a string of symbols as a particular word came from a very specific beginning. After receiving a book as a gift from her older sister (who then wrote PEGGY LAWLER on the fly-leaf, Peggy interpreted all small clusters of alphabetic symbols as “Peggy Lawler.” Later, as a consequence of being often read to, she became able to recognize the word “by,” which appeared on the title page of every book we read to her. There is no reason to believe she had any idea of what “by” might mean in that context. She did recognize that same word “by” in quite a different context, spontaneously pointing out the word in the line “These Romans are crazy, by Jupiter!” from an Asterix cartoon book. Her knowledge of reading as a process for interpreting graphic material is best seen in her observation when we read a book together, that she read pictures and I read words. From her remark, we can infer she would “read” by inventing a story based on her best speculation about the pictures’ meaning. She assumed that I was doing the same with the words. Not a bad assumption, but completely empty of any information about how written words signify as they do. Peggy’s introduction to computers did not have much to do with “reading” in terms of content. 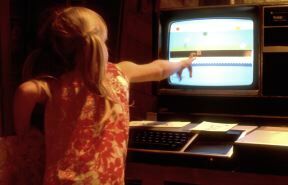 But her desire to control the machine led her into typing on the computer her first “written” word. Having helped load programs by pushing buttons on a cassette tape recorder, one day on her own Peggy typed “LO” on the keyboard of the computer terminal and then came seeking direction as to what letter came next. A few days later, she typed the “LOAD” command while the rest of the family was at lunch in a different room. 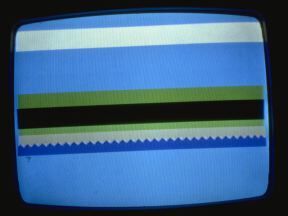 The initial microworlds were one for moving colored blocks around on the computer’s video display screen and another (made for her older sister but taken over by Peggy) which created designs by moving a colored cursor about on the screen. Her older sister used this drawing program to make designs, but Peggy’s first design was a large box—which she immediately converted into a letter “P” by adding the stem. Letters intrigued Peggy. They were a source of power she didn’t understand. A few days later, Peggy keyed the letter “A” and explained to me that “A is for apple.” Her comment suggested a way we could—on the computer— make a new kind of pre-readers’ ABC book. A child’s conventional book of ABC’s typically offers a collection of engaging pictures displayed in alphabetic order with a large, printed letter associated with each picture. The child looks at the pictures and is informed “A is for apple.” The relationship of letters to pictures is exactly the opposite in the ABC microworld we invented. The letter is the “key” for accessing the picture. That is, typing the key for the letter “D” on the computer’s keyboard produces a picture of a dog on the computer screen. Instead of responding to a statement such as ” See the doggie. D is for dog,” Peggy was able to try any letter on the keyboard, first, to see what it got her, and later, if the picture interested her, to inquire what was the letter’s name. She was in control of her own learning. She could learn what she wanted, when she wanted to, and could ask for advice or information when she decided she wanted it. The ABC microworld was tailor-made for Peggy. The shapes were selected and created on the computer by Peggy’s older sister and brother, aged ten and twelve. As a consequence of playing with the ABC microworld, Peggy developed a stable and congenial familiarity with the letters of the alphabet. More complex and interesting than the ABC microworld, the BEACH microworld provides a backdrop for action that can be controlled by the child. 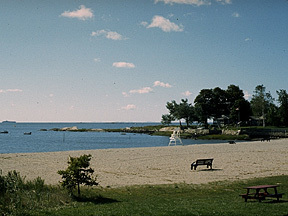 Waves and a beach in the fore-ground, with grass above, rise to a road, more grass, and clouds at the top of the display. Against that backdrop, Peggy could create a small picture of an object by specifying a name, then manipulate the picture with commands typed on the computer keyboard. Peggy typically began constructing a scene by typing the word SUN. A yellow circle would appear in the waves. She would raise it to the sky by keying the word UP repeatedly, change its color or set it in motion with another word, and go on to other objects. She could, for example, make a CAR image appear by keying that word, change its location with commands UP, DOWN, MOVE, and specify its heading and velocity with TURN, SLOW, FAST, FASTER, and HALT. These microworlds were created using LOGO, an easily comprehensible computer language which permits the programmer to assign meaning to any string of letters by writing a simple procedure that is activated whenever that string of letters is typed. LOGO’s procedure definition was especially valuable in customizing the BEACH world. 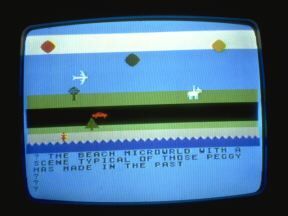 When Peggy first used BEACH, she was unhappy with the speed of the objects and asked, “How can I make them zoom, Daddy?” Nothing was easier than to create a new word, ZOOM, the procedure for which would set the velocity of the object with a single LOGO primitive command. In another instance, Peggy’s older sister made a horse-and-rider design and wrote a PONY procedure to create that object and set it in motion. After watching her sister edit that shape design, Peggy imitated the specific commands to create her own new shape. (She could not well control the design and ended with a collection of perpendicular lines. Asked what it was, she first replied, “A pony,” then later, “Something important.”) It is very likely that primary-grade children could create their own designs and would copy and alter procedures to expand or personalize the vocabulary of BEACH-like microworlds. As a direct consequence of playing with the BEACH world, Peggy learned to “read” approximately twenty words. Initially, she keyed names and commands, copying them letter by letter, from a set of 4 x 6 cards that I made up for her. Soon, her favorite words were keyed from memory. Peggy, keying “HOUSE,” one letter at a time. Less familiar words she would locate by searching through the pile of cards. When her mood was exploratory, she would try unfamiliar words if she encountered them by chance. Now, when shown those words — on the original 4 x 6 cards or printed elsewhere — she recognizes the pattern of letters and associates it with the appropriate vocal expression. Further, the words are meaningful to her. She knows what they represent, either objects or actions in the BEACH microworld. In the past, children have always learned to read words as alphabetic symbols for ideas to be evoked in the mind. For Peggy, words are that, but they are something else as well — a set of directions for specifying how to key a computer command. What is strikingly different in this new word-concept is that the child and computer together decode a letter string from a printed word to a procedure which the computer executes and whose significance the child can appreciate. Because the computer can interpret specific words the child does not yet know, she can learn from the computer through her self-directed exploration and experiment. The basic lesson I draw from this story is NOT merely about “motivation” — although Peggy did enjoy playing with these microworlds and learned from doing so. There is a more revolutionary aspect, one that is paradoxical as well. This new technology, although it may seem highly artificial, can make possible a more “natural” absorption of knowledge than learning to read from the printed page. The character of words experienced as executable procedure names brought Peggy into a new relationship with language, one different from what has been characteristic of learning to read in the past. Learning to read from print is necessarily a passive process for the child. Words on the page stand for other people’s meanings. Until children start to write they can’t use written words for their own purposes. Microcomputers put reading and writing together from the start. A word that Peggy can read is also one she can use to produce on the computer effects that interest her. For Peggy, reading the alphabetic language has become more like what every infant’s learning of the vocal language is like. Speaking is powerful for the infant, even for one who commands but a few words, when a responsive person listens and reacts. Likewise, the production of alphabetic symbols — even one letter and one word at a time — can become powerful for the young child when computer microworlds provide a patient, responsive intelligence to interpret them. A microworld scene typical of those Peggy made at 3 and 4 years. The change wrought by microcomputers may not be profound for Peggy. 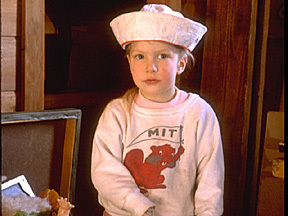 She would have learned to read anyway at six or five instead of three; but for many other children in the world — those with less responsive families and teachers, for example — the chance to use language symbols in microcomputers may give them a new access to the power of written words which can truly be called revolutionary. The computer revolution is worthwhile only if it liberates people. It has the potential to do so if those who care about individuals’ freedom and development join in shaping this plastic medium more to the service of mankind than narrow technical or commercial interests might be inclined to do. First published in the Boston Review (1982, June), in a issue dedicated to Computing, under the editorship of Eric Wanner.